Pope Shenouda III, the 117th Pope of Alexandria and the Patriarch of All Africa on the Holy Apostolic See of Saint Mark the Evangelist. The Coptic Orthodox Church of Alexandria is the name for the largest Christian church in Egypt. Its churches can be found worldwide, where it serves Coptic believers who have emigrated to other countries. On the 18th November 2012, the Coptic Orthodox Church enthroned His Holiness Pope Tawadros II as the 118th Pope of Alexanderia and Patriarch of the See of St. Mark. His Holiness is the successor to H.H. 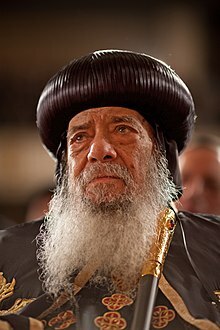 Pope Shenouda III who died in March 2012 after over forty years as the shepherd of all Copts. The Church belongs to the Oriental Orthodox family of churches. It has been a separate church body since the disagreement at the Council of Chalcedon in 451 AD. 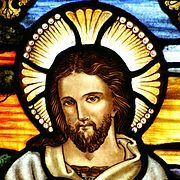 The Church rejected the new definitions about what Christ is like, introduced at the Council. The Church has daughter churches in Ethiopia and Eritrea, which now elect their own Popes. The Copts believe that their church was founded in Egypt by Saint Mark the Evangelist. Most Christians in Egypt are Copts. This page was last changed on 9 September 2017, at 13:25.